When you first get the list of bones, markings, and other skeletal features you need to identify in A&P lab, the names can seem very odd. That’s because they’re based on Latin. 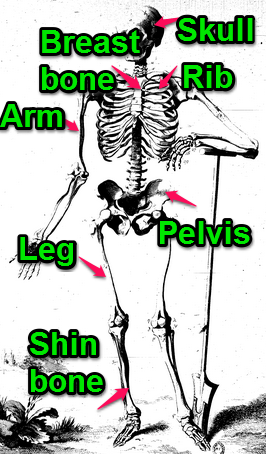 However, once you learn the meanings of these odd terms, you can use them as shortcuts to help you find and learn the bony structures faster and more efficiently! How? By translating the phrases, you can learn something about the specific structure, such as its location, its structure, or its function . . . and sometimes a combination of these characteristics. Find more tips on learning skeletal structures here! Yeah, I know it would be SO much easier if bone names were in plain English. But they’re not, and no amount of whining (I’ve discovered) is going to change that. And some terms you know already, because the Latin name is also the English name. For example, you already know rib, skull, and pelvis. The point is that it makes learning bone names far easier if you approach it as simply learning new names for things you (pretty much) already know. Let’s look at this approach a little more closely . . . In geography, if you are looking for a particular river on a map and you have no idea what a river is, then you’ll be looking at every label. It will take you forever to find it. But if you know what a river is, you’ll focus on the squiggly blue lines on the map—thus limiting your search and finding that river more quickly. If you already know the meaning of terms like river, creek, lake, ocean, hill, mountain, valley, ridge, and so on, you’ll find the going easier, right? Likewise, there are terms used in identifying bone features—often called bone markings—that serve the same purpose. 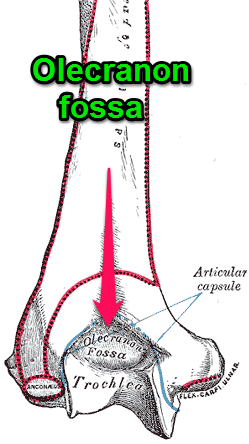 If you learn that a foramen is a hole and that a fossa is a depression, you’ll not only be able to find these structures faster, you’ll remember them for a long time. Using the example illustrated, if you didn’t know a fossa is a depression, you wouldn’t necessarily find easily in a specimen—because on a diagram, it could look like a bump instead. And you’d be looking for a bump when you should be looking for a valley. Before you begin learning specific names of bones and bone markings, learn the meaning of these basice “bone geography” terms. It may seem like wasted time—I know you are anxious to dive right into that long list of required structures—but it will save you time and frustration in the long run! Although most translated skeletal names are helpful in learning about each bone and marking, they are not complete descriptions of each structure. They are, however, useful mnemonics for identifying and learning. Mnemonic devices are learning aids that help you visualize and easily remember facts. For more on the value of mnemonics in learning anatomy—and how to use them effectively—see Mnemonics in A&P. 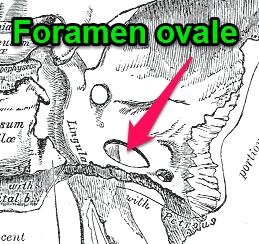 For example, foramen ovale (mentioned above) gives you a built-in image of an oval hole. 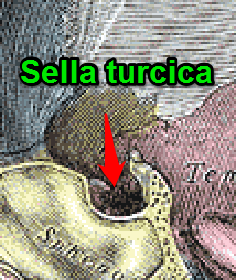 Some bone names, when translated, provide really vivid images for remembering them. 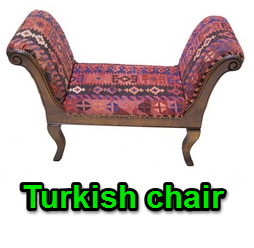 For example, the sella turcica in the skull translates as “Turkish chair” or “Turkish saddle.” The image of a Turkish chair—a backless chair with flaired, curling arms—is what this structure actually looks like. Sort of. Or you can think of it as a saddle with a high front (pommel) and high back (cantle). Either way, it’s a built-in, vivid image to help you remember the actual structure. The bottom line is . . . if you pay attention to structural names, it can help you learn about those structures quickly and accurately . . . and remember this information for a long time!